Playing with long exposure zoom. Introduction to the special section on open collaborative projects. Free and Open Source Software (FOSS) has become so widespread that it is now used in virtually every type of device and is distributed in almost every market. Scores of FOSS projects offer their software and try to attract contributors and users. In this context, a key question that has become increasingly relevant is whether FOSS projects need to legally formalise the contribution process by using Contributor License Agreements or Contributor Assignment Agreements, and if so, how such agreements should be drafted. This paper focusses on three general drafting options – assignments, exclusive or non-exclusive licenses – and analyses each of these options’ advantages and pitfalls. Given the global nature of FOSS, the paper adopts an international perspective by exploring two model jurisdictions that represent two contrasting legal systems and traditions: Germany, the drafter’s home country, with its typical continental-European legal approach; and the United States of America, a common law jurisdiction and globally the leading software-developing country. Internationalisation of FOSS Contributory Copyright Assignments and Licenses: Jurisdiction-Specific or “Unported”? Some of the major Free and Open Source (FOSS) projects use contributory copyright assignments and licenses to clarify the owner­ship of developer’s contributions and to allow the project to grant sublicenses and enforce copyright claims in case of license violations. The paper gives an overview of typical provisions of these agreements and provides an analysis of the private international law principles applicable in Europe, United States, and Japan. As a conclusion, the paper suggests an internationalisation strategy for FOSS projects. FOSS copyright assignments and licenses should implement choice-of-law clauses to foster legal certainty for projects. This article considers the emerging technologies known as Web 2.0 and how changing technologies may change the way we think about governance. In the last thirty years digital computing has had a transformational effect on the way governments view the world. The use of Information and Communications Technology (ICT) by governments has led to a more quantitative approach to solving problems; seen in the emergence of new public management and managerialism in public administration. 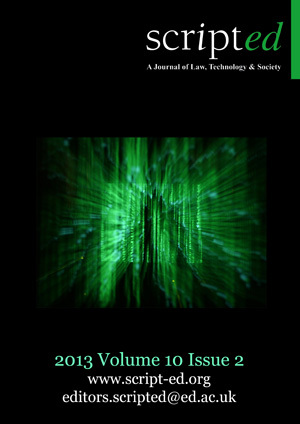 This article uses a theoretical framework, built on the phenomenology of tools and governance through choice, to argue that recent developments in the technologies generally referred to as Web 2.0, and social networking in particular, are leading to governments using technology in different and more interactive ways. The author concludes that these developments will broaden the impact of technology on governance, produce a more qualitative approach and empower the interconnected citizen. The Court of Justice of the European Union gave a preliminary ruling in Football Dataco Ltd v Sportradar GmbH and Others on the jurisdiction of the Courts on matters concerning the sui generis database protection. The previous Dataco case concerning copyright protection of databases, had been decided by the Court of Justice in the same year, however in this instance the solution focused essentially on the Court’s jurisdiction in the online environment which pivoted on the question of where the claimed extraction or re-utilization was deemed to occur.